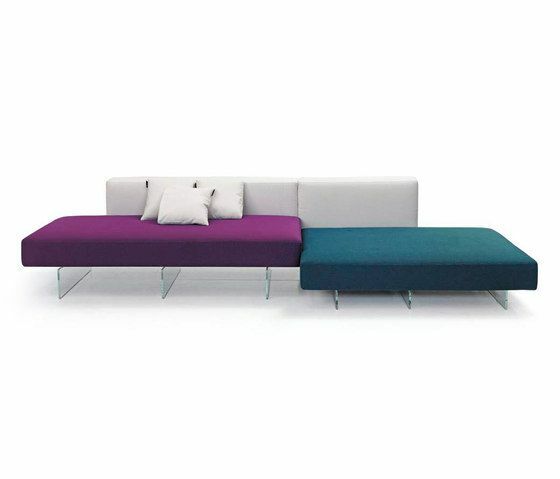 Winner of the 2010 Good Design Award A patented product for living rooms and other spaces with a design edge The Air upholstered furniture system revolutionises the concept of the sofa, which becomes modular and transformable. The sofa backs and seat cushions are completely interchangeable. This way, the sofa can be reconfigured over time, according to your needs or mood. A single sofa can be taken apart and reconfigured to become three armchairs or two sofas, depending on how you arrange the frames, seats, backs and arms. It is a revolution in spatial, aesthetic and even ergonomic terms: you get to choose the seat depth and sofa back height that suit you best. The glass legs contribute to making the sofa extremely ethereal, giving further lightness to the room. A single sofa can be taken apart and reconfigured to become armchairs or sofas, depending on how you arrange the frames, seats, backs and arms. It is a revolution in spatial, aesthetic and even ergonomic terms: you get to choose the seat depth and sofa back height that suit you best. The glass legs contribute to making the sofa extremely ethereal, giving further lightness to the room.